we only use the best, freshest ingredients that we can find. because of this, daily availability may vary. we receive weekly shipments of cheeses and meats from italy, so the offerings for the tagliere may differ each time you come in. all items on this menu can be ordered for eat-in or take-out. Please call to place your order: (201) 857-5188.
one Wednesday each month we will have a special menu as we take a culinary trip through italy. Please follow us on Facebook to find out the date, and the menu for the next culinary trip! 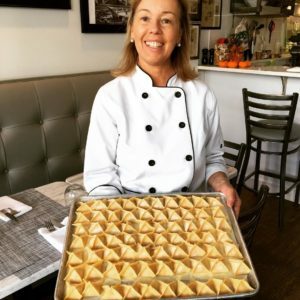 When Rome native Chef Claudia Rovegno moved to the United States in 2013, her mind was set on bringing a little bit of Italy with her. But she wanted to do it differently. Shortly after her arrival she started From Scratch to provide fresh, homemade, gourmet dinners and baked goods to families through an online storefront. After a year of success and building a strong following, she embarked on her next dream: to open a physical storefront. Energized by her passion of sharing great food with others, Chef Claudia brings you a unique shopping and dining experience. From Scratch combines fine Italian food selections and culinary expertise to create a one-of-a-kind grocery bistro where you can come in and feel like you’ve been transported into the slow-paced, culinary world of Italy. We hope you to feel like you’ve stepped into Italy when you step into From Scratch. Our goal is to educate you about the food you are eating and the products you see. We want you to experience the culinary delight you would if you traveled to Italy, all here in downtown Ridgewood. And, after you’ve been educated and delighted by what you’ve tasted, we hope you take a product home with you to share with everyone you know.